How can ketone level be decreased in a diabetic patient? 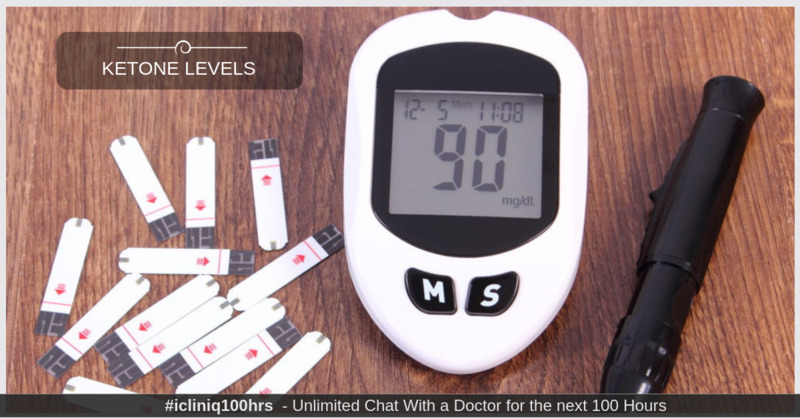 iCliniq › Ask a doctor online › Answers › Diabetology › Ketone › Is there any way to reduce ketone levels in a diabetic patient? I am a diabetes patient. My sugar level in fasting is above 350 and I checked ketone in urine, it was found to be 4+. My height is 170 cm approximately and weight check found 62 kg. What can I do for ketone? • My diabetic husband smells of alcohol. Could he have ketosis? Ketones usually develop more often in T1 diabetes. Especially when there is no adequate insulin and glucose levels are higher than 300 to 350 mg. It is necessary to take adequate water to eliminate those through urine. Avoid exercise when ketones are present. Try and maintain closer to normal glucose levels. Check glucose levels at home more often (every 3 to 4 hours). There is no mention of what is the treatment with the dosage of various drugs, PP glucose level, and HbA1c %. You have to bring glucose in better control to prevent ketones developing. If proper care is not taken, there can be a further complication of developing diabetic ketoacidosis, a medical emergency. If you have any questions please do come back. Plus it is necessary to look at your current treatment (drugs and dosage), diet pattern and extent of daily exercises. Will diabetes during pregnancy affect the baby?